1. Prepare the dough: Put masa flower in a bowl, and add water, oil and salt.Knead for a maximum of 3 minutes. Heat a comal or griddle for 20 minutes and prepare a tortilla press. Form 24 balls, 1 1/2 inches in diameter, from the masa, and make tortillas. Cook on the comal until crisp. Keep warm. Prepare the shrimp: If dried shrimp are salty, soak in cold water for ten minutes. Prepare the sauce: Combine onion, tomato, chiles, and cilantro in a bowl. Season with oregano and salt, and mix. Add lime juice. To assemble the tostaditas: Place shrimp on top of tortillas, and cover with tomato sauce. Serve 3 tostadas on each of 8 plates. 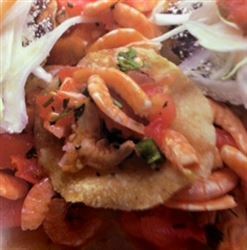 For a light lunch or an appetizer, dried shrimp are placed on tortillas and covered with tomato sauce. Enjoy this delicious tostadas Mexican recipe!